Over the last several decades, the introduction of new chemotherapeutic drugs and drug combinations has resulted in increased long- term remission rates in several important tumor types. These include childhood leukemia, adult leukemias and lymphomas, as well as testicular and trophoblastic tumors. The addition of high-dose chemotherapy with growth factor and hemopoietic stem cell support has increased clinical remission rates even further. For the majority of patients with some of the more common malignancies, however, palliation (rather than cure) is still the most realistic goal of chemotherapy for metastatic disease. 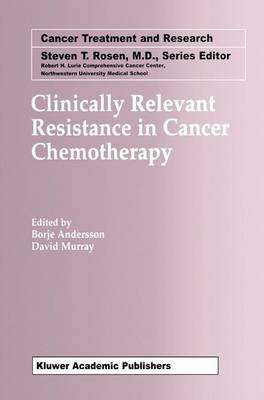 The failure of chemotherapy to cure metastatic cancer is commonly referred to among clinicians as "drug resistance". This phenomenon can, however, often be viewed as the survival of malignant cells that resulted from a failure to deliver an effective drug dose to the (cellular) target because of anyone of or combination of a multitude of individual factors. Clinically, this treatment failure is often viewed as the rapid occurrence of resistance at the single cell level. However, in experimental systems, stable drug resistance is usually relatively slow to emerge.